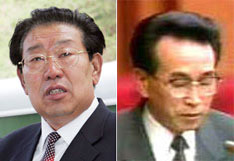 The North Korean regime in June last year executed the ex-minister of railways Kim Yong-sam on espionage charges and ex-finance minister Mun Il-bong over a botched currency reform in late 2009, it has belatedly emerged. A South Korean government official confirmed Kim's execution but was not clear about Mun's, saying, "We have relevant intelligence, which we are checking." According to a North Korean source, Kim, who was minister of railways between 1998 and 2008, was executed for involvement in a massive explosion at Yongchon Station in North Pyongan Province in April 2004 that allegedly targeted a special train carrying leader Kim Jong-il. Kim Yong-sam was accused of leaking information about the timetable of the train, which was returning from China. Kim Jong-il's travel itineraries are known only to his personal guards and secretaries and the railways minister. Mun, who was finance minister between 2000 and 2008, apparently took the fall for the botched currency reform alongside then director of the Workers Party's Planning and Finance Department Pak Nam-gi. The regime executed Pak by firing squad on the same charges in April last year. "It seems Mun was executed because public discontent got worse even though, unlike Pak, he had nothing to do with the actual preparations for the currency reform," the source said. About 20 senior officials in the munitions industry ministry and the second economic committee in charge of munitions were also purged for embezzlement late last year. They had reportedly been caught by the State Security Department attempting to siphon off money from arms exports. Another source said, "Rumor has it that the purge targeted long-serving senior officials in the military who have the authority to export arms overseas." The purge has been raging in Pyongyang since early last year, when Kim's son Jong-un was named as the successor to his father and the currency reform was sweeping the North, a third source said. "It seems Kim Jong-il is trying to remove obstacles to the transition of power with his own hands."